We live in an age where the food we eat is full of chemicals, water we drink is unhealthy, the clothes we wear are not organic, and the air we consume is polluted. How does one survive in such a situation and yet remain healthy and beautiful? By recoursing to the original and natural healing in the vedic culture of India – Ayurveda. Ayurveda is based on the idea of balance in body with the help of diet, herbal treatment and yogic breathing. It is a 5000-year-old system not just to treat illness but to create a healthy body and mind. Hence it wouldn’t be wrong to say that Ayurveda and beauty goes hand-in-hand. This article would list out some of the lesser known ingredients for great health and flawless beauty. Bhringraj – This is considered as the king of herbs. The oil of this herb is a one-stop solution for all the hair woes. Its medicinal properties boost hair growth and strengthens the roots of the hair. Honey – Honey is considered a natural source of energy and an antioxidant powerhouse. When it comes to ayurvedic beauty care, Honey takes one of the topmost place in the regime, and is used as medicine since ancient times. This is the reason it is considered as one of the main ayurveda health secrets. Sandalwood – With age, we lose the moisture and elasticity from our face, and sandalwood comes handy here. It has cooling and calming effect on your skin and is used to improve skin tone, scars and acne from the face. Sandalwood when combined with turmeric is a golden magic that instantly lifts sin up. Margosa – More commonly used as Neem, this tree is called to be rich in medicinal properties. In ancient times, neem was called the first preference in case of acne, clogged pores, irritation, sun burn or any other skin problem. It is a common tree that is found all over India, and helps to make the hair and skin healthier. Regular use of margosa will get you a moisturised skin and even increases hair growth. Green Apple – One of the tried and tested products in the books of Ayurveda beauty is Green Apple. They contain a lot of nutrients, vitamins, minerals, proteins and fibers, and hence called exotic and amazing fruit. It also contains Vitamin C that prevents skin cells damage by free radicals and helps in cell rejuvenation. This property helps in keeping skin and hair healthy and supple. Dandelion – Dandelion, whose scientific name is taraxacum, is an excellent detoxifier, diuretic and antioxidant. This makes it a boon for people with acne prone skin. Dandelion is one of those herbs whose all parts, including leaf, top and roots are healthy. So if you are fighting a tough battle with acne, skin diseases, burns, stings, poor hair growth or dandruff, head to this Ayurveda secret. Kelp – A miracle ingredient for people with dry skin, Kelp contains Iodine, Minerals and antioxidants that moistures and softens the skin by retaining its ph level. In Ayurveda, a lot of emphasis has been put on this seaweed for attaining a healthy body and skin. Now you can reap benefits of the pristine science of Ayurveda by bringing your body, mind and soul in harmony. 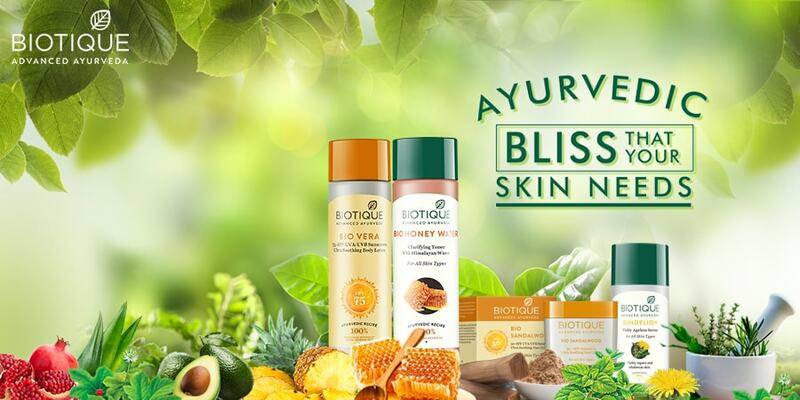 Biotique has strong roots in Ayurveda and brings authentic products that are close to nature. Bio Bhringraj therapeutic intensive hair regrowth treatment oil is one product which nourishes the scalp and strengthens hair strand for fresh growth. This oil is extremely helpful for people with poor hair growth as it stimulates the scalp and encourages new hair growth. Bio Morning Nectar is another offering from Biotique that is filled with the goodness of honey, which is the commonly used product in Ayurveda for beautiful skin. The sunscreen ultra-soothing lotion is proven for a flawless skin, as it protects the skin from harsh sun rays, whereas also retaining the moisture in the skin. Similarly, the Bio Morning Nectar Skin soap is loaded with honey, juices of pineapple, tomato, lemon and papaya for sustained skin vitality and elasticity. It would be unfair to talk about Ayurvedic beauty secrets and not talk about Sandalwood. Its unique anti-bacterial properties make it a very appropriate ingredient for today’s age which is filled with pollution and strong UV rays from sun. Here the Bio Sandalwood Face Lotion comes handy, that gives a broad spectrum SPG 50 UVA/UVB sunscreen and is extremely water-resistant. 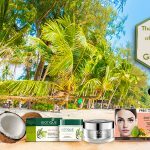 So if you are planning a Goa trip with friends, you may not want to forget keeping Bio Sandalwood in your bag, to save yourself from the sun tan. Bio Margosa Anti-dandruff shampoo and conditioner is another great product in Ayurveda for beautiful hair. It controls dandruff, moisturises the skin, and leave hair shiny and bouncy because of its natural tendencies of discarding dirt and bacteria. 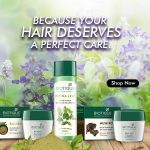 Similarly, people with oily scalp and hair can try Bio Green Apple shampoo and conditioner that is blended with pure green apple extract and can be used even daily without the fear of any side effects. We have also an ageless lightening serum in Bio Dandelion that takes it cue from Ayurveda beauty secrets and visibly reduces dark spots and eases away wrinkles. It is further perfected with the 21st century swiss biotechnology, making it a perfect use for today’s generation. Bio Kelp shampoo is another gift from mother nature, hidden as a seaweed, packed with minerals and vitamins which are magic for hair growth and shiny hair. If you talk about Ayurveda beauty care for your hair, you can’t afford to miss Bio Kelp shampoo. The healing traditions of Ayurveda beauty is creating waves in the cosmetic skin care industry. 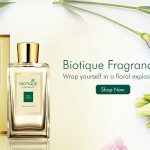 While it’s difficult to find out the authentic Ayurveda stuff from the synthetic ones, Biotique has a track record of using 100% ayurvedic recipe. Try it to believe it, and feel the difference in your skin!